Tour operator Czech Trek has launched a range of microadventure tours to give time-pressed visitors to Prague an authentic taste of the Bohemian culture and countryside. With overtourism an increasing concern in the Czech capital – now one of Europe’s five busiest destinations (Euromonitor 2017) – this newcomer to the market is urging tourists to take a hike. “There’s more to the Czech Republic than Prague,” says owner Pavel Šedivý (38), the born-and-bred Bohemian and environmental expert who leads all Czech Trek tours. 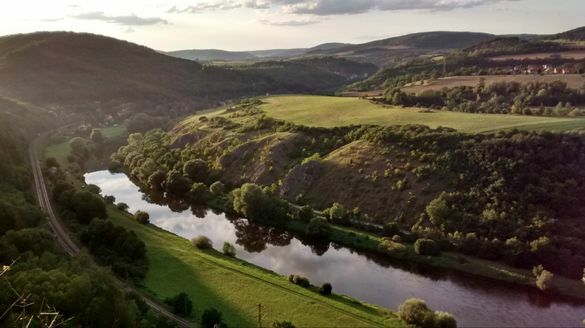 One-day guided hikes take visitors through the rolling hills and tranquil forests of Český Kras nature reserve to the picturesque village of Karlštejn – famous for the fairytale gothic castle built by Holy Roman Emperor Charles IV. Tours begin with a scenic train ride out of the city to the starting point of the hike (travel time 25 – 45 minutes). Group sizes are limited to six to allow hikers ample time to pick their guide’s brain. An environmental and forestry engineer by training, Pavel explains the forces that have shaped the landscape and enlightens curious visitors on Czech history and culture. Czech Trek is a new independent tour operator specialising in one-day guided hikes within easy reach of Prague. Tours start in the city centre and end in the village of Karlštejn. A full-day hike is priced at €50 per person. A half-day hike costs €35 per person or €90 for a family ticket. On request Czech Trek also organises bespoke hikes to other destinations and tailored to the needs of groups. Owner Pavel Šedivý leads all tours himself. He holds twin Masters degrees in Environmental Management and Forestry and lives with his family at the heart of Český Kras nature reserve.